2018, just like every year, has had its fair share of ups and downs.We lost Aretha Franklin, watched Kanye become a keyboard warrior as a viral Twitter theory argued that Drake had been dropping hints that he’d hooked up with Kim K. I mean, Kiki do you love me? And then there was the football World Cup, need we say anymore.Yet, through it all we’ve also had lots and lots of great new music. And here at Chalkpit we’re all about the positives. Last year we launched our weekly Artist Alert segment, where we’ve been handpicking our favourite new artists for you, alongside our weekly Hottest Hits playlist so that you could have the best new music, repped by us, straight to your phone. No work required. We also headed up to Leeds to start building our new Chalkpit HQ alongside some of the best new acts coming out of the North. And if you missed any of this, we’re about to give you a run down of our favourite Artist Alerts of 2018 and who’s already got out attention in 2019. London duo VŌS also played a huge role in our sound of 2018. Their newest track ‘Serious’ took top spot on our Hottest Hits and we’re still heading into 2019 with it on repeat. Kalpa were another band we had all eyes on in 2018, Hottest Hits feature ‘What Will It Take’ captured their distinctly organic sound and we’re looking forward to catching them live this year. 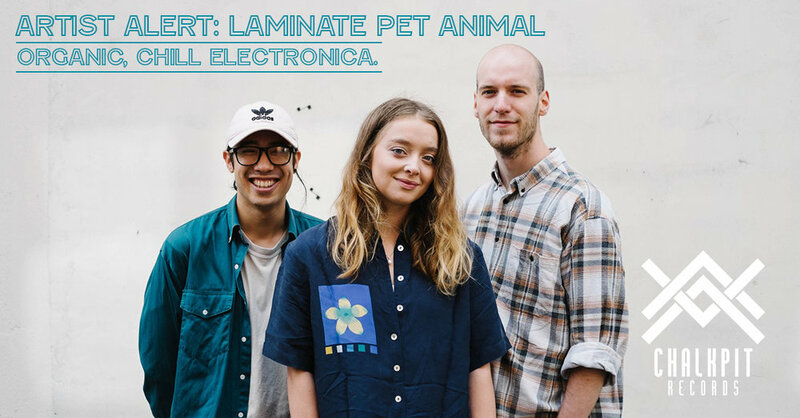 We kicked off our Artist Alert with electronic trio Laminate Pet Animals. who came out with their newest EP ‘Panama’ in May. While summer might seem like a lifetime away, Laminate Pet Animals’ dreamy soundscape is still perfect summer nostalgia and we definitely won’t be leaving these guys in 2018.
an enigmatic band whose maturing sound is coloured with indie riffs and eerie vocals. We fell in love with track ‘I’ve Wanted’ but really, they make it easy to say that about any of their releases. Polo are our band to watch in 2019. Their 2018 release ‘Louder Than Words’ reinforced their spatial, synth driven sound that reaches across the divide between dance and indie music. Like many in the industry, we’re really excited about them and you’ll be sure to hear us raving about Polo more in 2019. For 2019 our sights are set on bringing more of you even bigger new music events. This month we’re back in Leeds with our official launch party and then in February we head down south to where it all began to watch the phenomenal Another Sky headline Strings. Finally, don’t let the January blues catch up with you, because Chalkpit have got all the new music and live events to get you through. We’ve even got some surprises in store. Stay tuned.